Solar Energy, Solar Power: Why Not Now? With the threat of global warming, and the gradual depletion of petroleum supplies, it is natural to ask "why we don't use more solar energy?". There are two basic problems that have so far limited the use of solar power on a large scale: energy intensity, and cost of the technology. Even though sunlight energizes virtually all processes on Earth, the amount of solar energy falling on one square meter of ground is actually pretty small. The average amount of sunlight reaching the surface of the Earth is about 300 Watts per square meter (about 10 sq. ft.). This value is larger in the tropics or where there are few clouds, smaller at high latitudes and where it is frequently cloudy. One rule of thumb is that a collector area equal to about 10% of the floor area of a house is required to provide most of the heating needs for that house. So for a 2,000 sq. ft. house, 200 sq. ft. of collector area would be needed. For centralized collection of solar energy, large land areas need to be covered with solar collectors in order to gather enough sunlight to generate a significant fraction of our energy needs. Concentrating the sunlight with mirrors does not increase the amount of energy that is collected. In fact, focusing the energy to produce higher temperatures usually leads to more loss of energy since the most efficient energy collection systems are those that run at temperatures close to the temperature of the environment around the collector. 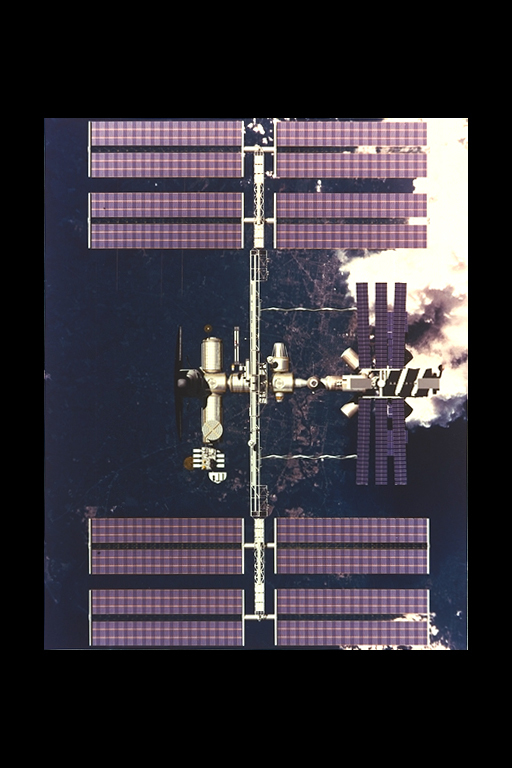 Whether in the form of water-heating solar panels, or photovoltaics to generate electricity from sunlight (like in the accompanying image of solar panels on the Space Station), the solar energy technology is relatively expensive compared to, say, coal-fired power plants. Electricity costs in the United States average 7 cents per kilowatt-hour. A currently advertised inexpensive 3 kilowatt (peak) solar system bought in California, after a hefty state rebate and tax incentive, will cost $6,552. Running at an average of 30% of peak capacity (no sun at night, cloudiness, etc. ), this system will take ten years before it costs less than buying all electricity from utilities. Of course there are some applications where solar energy makes economic sense. Photovoltaics power remote data storage or transmitter devices where electricity is not available. Some very poor villages in Africa use inexpensive solar collection devices for cooking and heating of water. Passive solar design of new houses and buildings can greatly reduce energy costs since, through smart design, much of the house becomes, in effect, a solar collector. Even if a solar system could be installed for a cost that would be paid back in only 3 years, how many people would buy it? Most people would rather pay less now, rather than invest in something where the payoff is years down the road. First-time home buyers are usually trying to buy as large and as nice a house as possible for what they can afford in a monthly payment. Barring a massive change in public sentiment, it will probably take government regulation to force higher efficiency standards on the building industry, since the public is unlikely to voluntarily make such an investment. There will, of course, always be some people who will opt to make these investments voluntarily. What About Solar Collectors in Space? Greater amounts of sunlight can be collected in outer space, where a satellite can be kept in the sun continuously, and clouds are not a factor. But the roughly factor of three increase in energy intensity is offset by inefficiencies in transmitting that energy to the ground. If it was transmitted as microwave energy, much of the energy would be lost because the large antenna required would not be able to concentrate the energy into a very small area on the ground to be received. Indeed, the antenna required to receive the energy on the ground would be much larger than just putting solar collectors on the ground. There would also be environmental concerns about transmitting huge amounts of energy over such a large area, and the potential dangers of the space transmitter missing the receiving antenna on the ground. Not the least of the problems is the very high cost of launching anything into space. Despite the competitive disadvantage that solar energy technologies have right now, the availability of "free" sunlight will remain a driving force behind the development of new ideas that can make solar power more affordable in the future. As economies of scale are achieved in the manufacture of solar collection devices (both thermal and electric), and as petroleum prices gradually rise, solar energy will become more cost competitive.